In December, my in-laws came from Boston to visit us and help us celebrate our first Christmas in Chicago. We laughed, played Catchphrase about a hundred times (us girls kept winning! ), and ate a delicious Christmas dinner courtesy of Katie, my brother-in-law's lovely lady. She made a spiral ham, yams with a hint of orange, and green beans, but my favorite part of the meal was the cauliflower. It was AMAZING! So amazing, in fact, that I actually went to Katie's recipe blog, The Gypsy Kitchen, and MADE the cauliflower gratin myself. If you know me, you know I hate cooking so the fact that I even looked at the recipe is a miracle in and of itself. 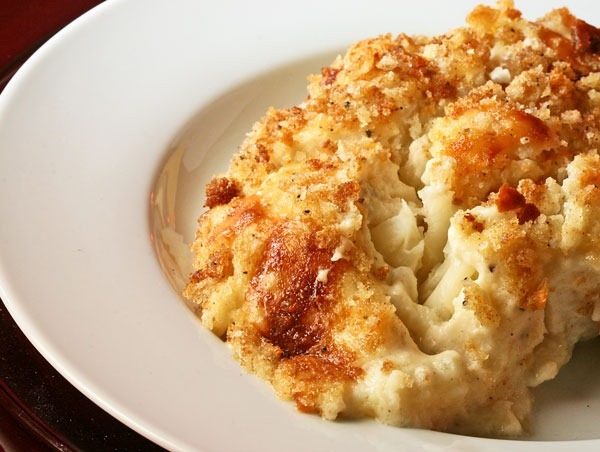 Cauliflower is a great substitute for mashed potatoes and can be spiced up a variety of ways. Though I've had mashed cauliflower before, cauliflower gratin is definitely my fave. Check out Katie's recipe below (see my notes in red) or head over to The Gypsy Kitchen to see more jaw-dropping recipes. Cook the cauliflower florets in a large pot of boiling salted water for 6 minutes and drain. Cauliflower should still be firm. Meanwhile, melt 2 tablespoons of butter in a saucepan over low heat. Add the flour, stirring constantly with a wooden spoon for 2 minutes. Pour the milk into the butter-flour mixture and stir until it comes to a boil. (it took about 10 minutes for mine to boil. don't know if I was doing it wrong or if this is normal) Boil, whisking constantly, for about 1 minute, or until thickened. Turn off the heat and add add salt, pepper, nutmeg, 1/2 cup of the cheddar, and all of the Parmesan. Pour 1/3 of the sauce on the bottom of an 8 by 11 baking dish. Place the drained cauliflower on top and then spread the rest of the sauce evenly on top. Combine the bread crumbs with the remaining 1/4 cup of cheese and sprinkle on top. Melt the remaining 2 tablespoons of butter and drizzle over the gratin. Sprinkle with salt and pepper. Bake for 25 to 30 minutes, until the top is browned. Serve hot or at room temperature.